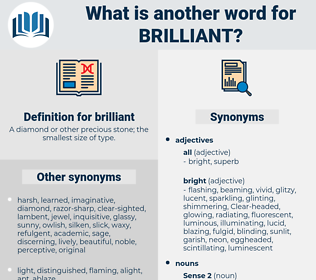 What is another word for brilliant? A diamond or other precious stone; the smallest size of type. briiliant, vibrant, exceptional, smarter, intelligent, outstanding, high-gloss, inspiring, first-rate, fascinating, pre-eminent, well-deserved, delightful, prominent, successful, gifted, glorious, vivid, exemplary, resounding, grandiose, neat, incredible, commendable, best, better, wicked, handsome, lively, first-class, formidable, preeminent, wondrous, nifty, interesting, exquisite, prodigious, enlightening, strong, rosy, tremendous, breathtaking, ideal. demonstrators, guys, outstanding, cheers, glorious, incredible. glittering, resplendent, distinguished, glowing, radiant, spectacular, clever, extraordinary, stellar, masterful, exciting, ingenious, admirable, sterling, phenomenal, talented, eminent, colorful, stunning, bright, dazzling, entertaining, sensational, wise, wonderful, masterly, shiny, incisive, notable, resourceful, golden, excellent, inspired, great, amazing, glossy. 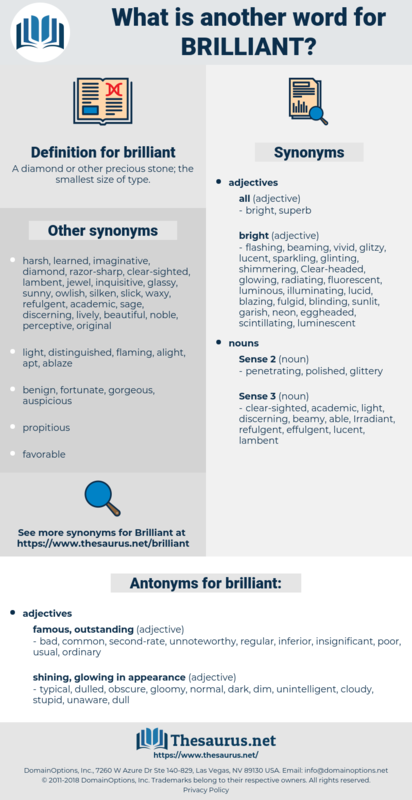 bright, brillantes, wonderful, shiny, excellent, great, glossy. wonderful, excellent, gem, shine, amazing. remarkable, wonderful, neat, excellent, formidable, great, amazing, tremendous. bad, common, second-rate, unnoteworthy, regular, inferior, insignificant, poor, usual, ordinary. typical, dulled, obscure, gloomy, normal, dark, dim, unintelligent, cloudy, stupid, unaware, dull. asinine, unobtrusive, concealed, unnoticeable, pitch black, foolish, unemphatic, kooky, wacky, fool, unreverberant, subdued, hidden, leaden, balmy, lowbrow, preposterous, nonresonant, colorless, muted, unflashy, understated, insane, unimpressive, brain dead, uninformed, conservative, nonsensical, blackened, gray, pitch-dark, inconspicuous, feebleminded, quiet, dippy, crackpot, senseless, cuckoo, toned down, harebrained, empty-headed, zany, mad, restrained, subtle, unremarkable, simpleminded, unassuming, sunless, colourless, daft, unthinking, unintellectual, idiotic, featherheaded, dotty, undistinguished, nutty, tomfool, absurd, vacuous, imbecile, unimportant, screwball, pinheaded, cockeyed, loony, lackluster, palish, half-baked, plain, unpretentious, Daffy, modest, nonintellectual, unaffected, lunatic, moronic, crazy, sappy, silly. As the brilliant light broke over them they scattered with a cry of astonishment. There were no tears in Philippa's brilliant eyes, but there was a faint patch of colour in her cheeks, and her lips were not quite steady.